For the last few months, the rumor mill has been churning out new reports of what Apple may have in store for the next iPhone. One of the great possibilities assumed by the tech scene has been a lower-cost iPhone aimed at the low-end of the market. Continuing to feed this speculation, an alleged picture of the shell of the upcoming device has been leaked onto the web this morning, by the same source who leaked an alleged case along with the iPad 5 release date. Could this be the new low-end iPhone? Find out after the jump. The picture depicts a shell made entirely out of polycarbonate plastic, the same material that the iPhone 3G and 3GS were made out of, as well as the first-generation MacBook. Standard volume controllers are visible, as well as a large space for a camera, flash and microphone. There does not appear to be a serial number on this shell, which has led some to doubt its authenticity. The same report also dishes out some details regarding the new iPhone. The source claims that the new smartphone will be available in different colors other than black and white, for the first time in an iPhone product, introducing blue, red and yellow flavors. The new low-end iPhone will also allegedly be powered with an A5 processor, much like the iPad mini, and Apple will be pinching some extra pennies by powering the device with a 3.5-inch Retina display, smaller than the one found on the current iPhone 5. Unlike the 8-megapixel camera found on the iPhone 5, the low-end device will allegedly ship with a 5-megapixel sensor, similar to the one found on the two-year-old iPhone 4. This new model is not expected to replace the standard iPhone, which is also rumored for an upgrade later this year. Instead, it is meant to complement the main model by offering a cheaper option for a lower segment of the market, which has recently been inundated with low-end Android devices. 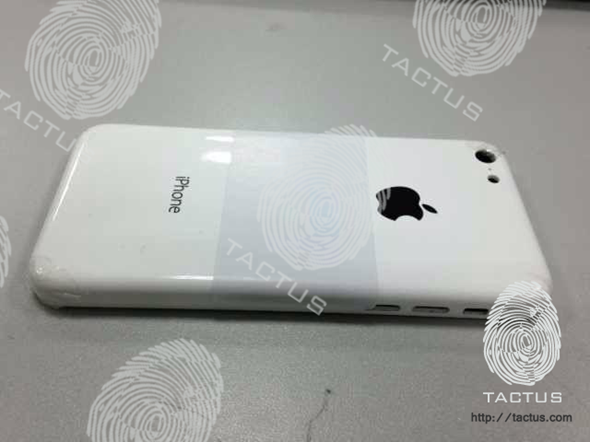 Since Apple has not officially commented on the upcoming device, as it is it’s practice, this new alleged leak may not be more than a case design crafted by a clever iPhone enthusiast. However, repeated reports pointing to an upcoming low-end iPhone to complement the main model suggest that there may be some light of truth to this new leak.